Enter to be October's Soldier of the Month here! With the Backstreet Boys’ ninth studio album coming sometime this fall (and rumored to be in October! ), the question most fans want to know is a simple one – what will it be called? In the past, the Backstreet Boys have named the album either random names that have nothing to do with the songs, “Millennium,” “Black & Blue” or “Unbreakable” or named them after songs, such as “Never Gone,” “Backstreet’s Back” and “In A World Like This.” As of now, the one song that we know will be on the album, “Don’t Go Breaking My Heart,” probably won’t be the album title. So as fans, what would we pick? The question of the most for September 2018 was exactly that – if you could name the album, what would you pick and why? According to Priscilla, despite their professional accomplishments (which includes Grammy nominations, nine Top 10 Billboard albums, the record-breaking Las Vegas residency and the new Top 10 hit), they have shown that there is nothing they can’t do. Meet your September 2018 Soldier of the Month, Priscilla Consolo. Where are you from? Brooklyn, New York – born and raised and never left. What do you do for a living? Currently, I am a full-time student at New York University (NYU) School of Law, which I am attending on a full-scholarship. I am in my third and final year studying for my Juris Doctor (JD) degree. After graduation, I plan on working for a large law firm in their litigation department. Tell us a little bit about yourself: I’m 24 years old (I was born in March of 1994). I’m currently engaged to my fiancé, Adam, who is a police officer with the NYPD. I have a younger sister, named Gabriella, who is also a Backstreet Boys fan (she is an AJ girl). I graduated from Fordham University in 2016 with my Bachelor of Arts degree in History and Political Science. I have a background in government and politics. Even when it was “uncool” to be a Backstreet Boys fan, I never gave up on them. I’ve always loved them and I shamelessly promote the Backstreet Boys at every chance I get. How long have you been a BSB fan? I’ve been a Backstreet Boys fan since 1997 or 1998, when the boys became really popular in the United States. I was only a young kid at that age, but I still remember loving the boys even back then. I’ve basically been a fan for almost my entire life (since I was like three or four years old). How did you become a fan? I don’t remember an exact moment. Back in the late 1990s and early 2000s, when I was a little girl, I would see the Backstreet Boys on television and hear their music on the radio. I remember seeing their music videos on MTV or see their appearances on the Disney Channel or Nickelodeon. Back then, the boys were everywhere – they were on top of the world, the most popular band in the world, and at the height of their fame – so it was really easy to see them on TV or hear their music. I remember asking my parents to buy their albums for my birthday or Christmas and then I would sit down with my CD player, open up the album booklet, and flip through it as I listened to their music with my headphones on. I’d actually sit there and read the lyrics to their songs printed in the album booklet and memorize the words so I could sing along. I’d buy all the tween or teen magazines (J-14 or M magazine) and carefully rip out the pin-up posters and tape them to my bedroom wall. What is your favorite BSB memory? 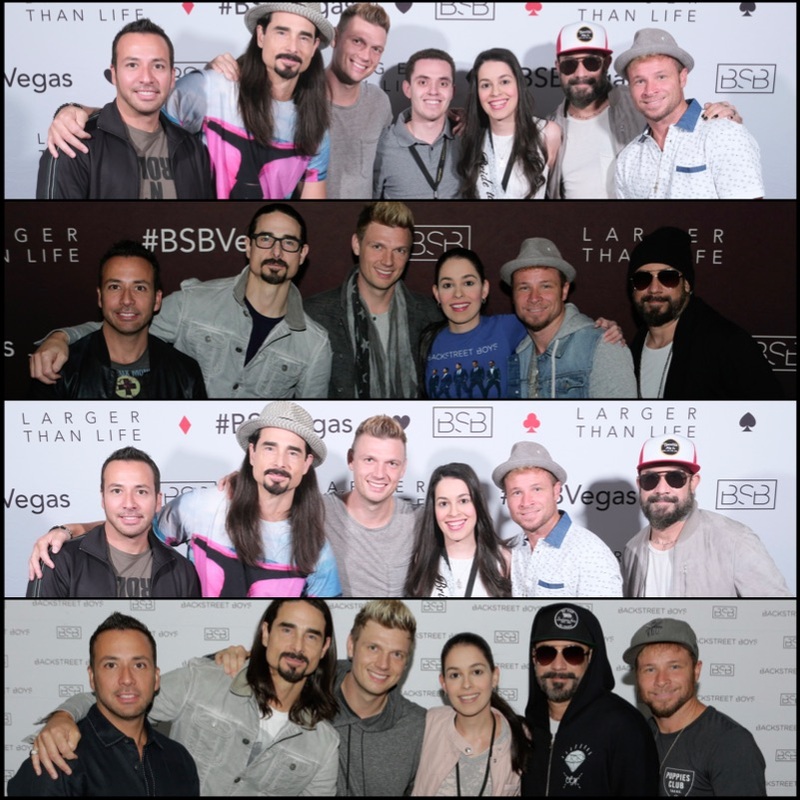 This past August, I traveled to Vegas for a second time to see the Backstreet Boys residency. The whole trip was my favorite BSB memory. This time, my fiancé Adam came with me and we made a week-long vacation out of the trip, celebrating our recent engagement. I also splurged, because it was the first time we were able to take a vacation in 18 months, after I had just finished two years of law school and two years of working full-time in the summer, and my fiancé recently graduated from the police academy and started working as a cop. We went to the concert three times – one night we were in the front row in the right pit, where Nick came over, grabbed my hand, and sang to me during More Than That. The next concert, we were in the left pit, again front row, and we got a lot of attention from the boys. That day we also had Meet & Greet where we all got to meet the boys for the first time together (I’ve met them before). When we told them we had recently got engaged, they were so happy for us and congratulated us and asked us about out engagement and our upcoming wedding. They also were eager in learning more about us and asked us a bunch of questions, and when I told them that my fiancé is a police officer, Brian genuinely thanked my fiancé for his service, which we really appreciated. The last night, we were at a VIP Front & Center Table (which counted as my birthday present). All of the boys interacted with us, but my favorite moment happened when Nick walked over and grabbed my hand during More Than That (yes, again!) and sang to me. It was the most magical moment as he looked into my eyes -- something I will never forget. Adam and I also went to Howie’s birthday party event, which was really cool because we actually got to hang out with Howie and spend some time with him in a rather relaxed setting. We also did VIP for the after party both nights, where again, we spent a lot of time with the boys. It was really special to actually be able to have a full conversation with them and relax and have fun with them as they also took selfies and signed autographs for us. We got a lot of time with the boys and they were just so gracious and generous with us. We were able to really appreciate how down to earth and human they are. We both really enjoyed spending all that time with them. What is your favorite BSB song and why? I have a lot of favorites, so I’ll name some honorable mentions here which include Drowning, As Long As You Love Me, All I Have To Give, Bigger, and More Than That. And I’ll always dance to The Call, Larger Than Life, or Everybody. But, if I were to pick my two absolute favorites, the first would have to be Shape of My Heart. Out of all the classics, this one really touches me deeply. I don’t know how else to explain it other than to say that when I hear it, I basically feel the song in my soul. It takes me back to another place and is so nostalgic for me. I also feel like each of the boys’ solo verses fits them perfectly. Brian starts out the song with this angelic, soothing voice that is as smooth and sweet as honey over this booming heartbeat-like sound that really resonates with me. Then AJ brings his deeper, raspy, soulful voice as the song continues to pick up with the beat. And then Nick brings his emotional intensity as the song reaches its climax. I find the song to be an experience of tension being released as if the music was breaking through the atmosphere. My second favorite song would have to be the fan favorite, Safest Place to Hide. Similarly, I feel that each boys’ solo part really lets the character of their voices shine through, connecting to the lyrics. I also feel this song is the greatest of all the BSB love songs. It also has a very calming effect. It really conveys a meaningful message about how someone can be your home, your sanctuary, your refuge – the place you seek shelter “when the storm is raging outside.” I think anyone who ever has experienced true, unconditional love knows how that feels. What is your favorite BSB video and why? Right now, it would have to be Don’t Go Breaking My Heart. First of all, can we just say how good the Backstreet Boys look in this music video? In this music video, the boys bring the fire and do not shy away from it. I also really love the production of the video – the special effects, the lights, the editing. Everything looks seamless and yet distinct at the same time. Also, the dance routine has such an energy and intensity. I love how the chorography fits so well with the music and the lyrics. Plus, I feel that you can really tell how much the boys are enjoying performing the song in the video – you can feel their passion. Who is your favorite Backstreet Boy and why? Growing up, I was a Nick girl. That long blonde hair and blue eyes, his boyish looks, that adorable smile – it was like love at first sight. I had the biggest crush on Nick because I just thought he was so cute. Plus, he was the closest in age to me and as the young, heartthrob of the group, I naturally gravitated towards liking him the most. However, over the years, Brian has grown a lot on me (he was my second favorite when I was younger). I always loved Brian’s infectious laugh, his gentle and kind personality, and his playful sense of humor. Also, Brian openly practicing his Christian faith is often a source of inspiration for me. Now, I consider myself a Frick & Frack girl and can’t really choose between the two of them. I love their voices the most too and still adore their relationship. I’ve felt like they’ve always had a special dynamic and seeing them joke around is just hilarious. How has BSB impacted your life? The Backstreet Boys are one of my fondest childhood memories. I feel like their music played a key role in me growing up and so they are a source of happiness. However, the Backstreet Boys are more than just my favorite band. Because I know their story, I often find them to be a source of inspiration as well. Individually, the boys have each endured their hardships and struggles, and collectively as a group, they’ve gone through some difficult times and overcome many obstacles. A lot of people don’t realize that about them and assume they all have led perfect lives. But I know they are imperfect and have fought their battles. And so, I often think about what they’ve gone through and see them as giving me hope to continue getting through the difficult moments. Often when I am having a bad day or going through a challenging time, I will listen to “Show ‘Em What You’re Made Of” and the song will serve as a message to never give up. What is your favorite thing about being a BSB fan? The Backstreet Boys are a lot of things (artists, musicians, vocalists, songwriters, celebrities, husbands and fathers) but I love seeing them as performers and entertainers. I believe the boys put on one hell of a show. Between the dancing, the singing, and connecting with the audience (plus them just goofing around off script), it’s impossible not to enjoy yourself. Also, I love meeting other BSB fans and bonding with them. I feel like we have a great network and community – the BSB Army – that allows us all to be connected, to share with each other, and help each other. We’re really more like a family a lot of the time. Have you been to Vegas? I’ve been to Vegas twice so far – once in March 2017 during the very beginning of their residency and again in August 2018. I’ve seen the Vegas show five times so far and they all have been amazing. I’m hoping to go one more time before the residency ends. What has been your favorite BSB moment over the past 25 years? When the boys were on Good Morning America in May 2013 to announce their new album and tour for In A World Like This, and also performed “Everybody (Backstreet’s Back)” and “Permanent Stain.” The boys performed inside the studio for a small, intimate audience of their die-hard fans, and I was really fortunate to be one of those fans (I won through the Fan Club contest)! That was actually the first time I saw all five of them perform together live and the first time I met them all too (I had seen the boys, minus Kevin, in concert before that and met the four of them a bunch too, but meeting Kevin and having them all back together was really special). After the show ended, the boys all came over to everyone to talk, take pictures, and sign autographs. They probably stayed around with us for about an hour. The whole experience was surreal. What's one thing you are most looking forward to with the future of the Backstreet Boys? After hearing “Don’t Go Breaking My Heart,” I really cannot wait for the boys to release some more new music! I feel like this album is really going to be an incredible demonstration of their artistry and talent. I am so looking forward to their album being released and seeing them on tour. As much as I love seeing them in Vegas or see them perform their hit songs, I do appreciate them making new music for us because it keeps them fresh and current. And honestly, if the Vegas residency and the success of Don’t Go Breaking My Heart proves anything, it’s that the Backstreet Boys are ready to take on the world again.